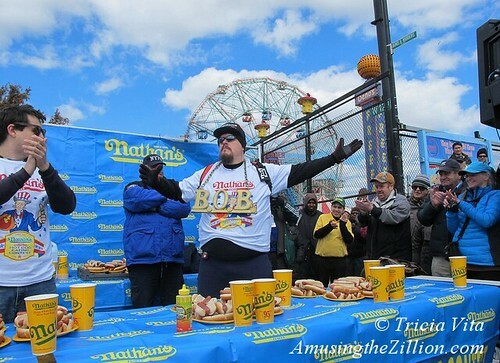 On Saturday in Coney Island, Nathan’s Famous celebrated the reopening of their Boardwalk eatery and Coney Island’s Opening Weekend with the first hot dog eating qualifying round of the season. The winners were Bob Shoudt AKA “Notorious B.O.B.,” who ate 36 hot dogs and buns in 10 minutes, and Larell Marie AKA The Real Deal, who ate 17. 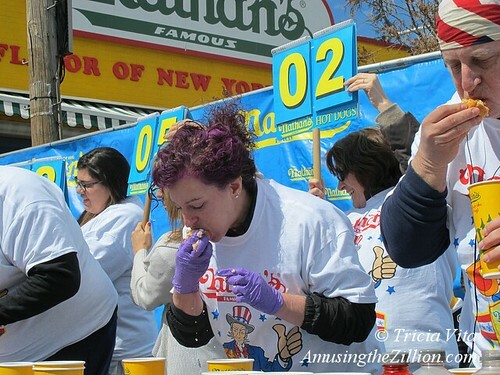 They will return to Coney to compete on July Fourth, when separate men’s and women’s hot dog eating contests are held in front of the original Nathan’s at Surf and Stillwell, which is being rebuilt after Sandy. Compared to the hugely attended and tightly choreographed July 4th event televised on ESPN, the qualifier had a refreshingly impromptu air. A couple of “Bunettes,” the ladies who flip the cards indicating the number of franks consumed, had to be recruited from the audience, which consisted of a few hundred people. 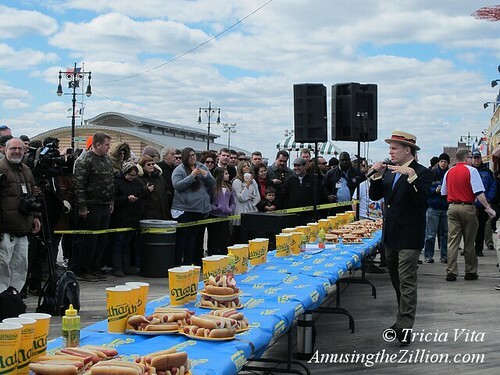 The event was the first-ever hot dog qualifier held in Coney Island, according to contest organizer and emcee extraordinaire George Shea. After winning yesterday’s qualifier, Shoudt tweeted: “Since 7/4/07 only one man besides myself has won the Nathan’s hotdog eating contest at Coney Island, just sayin’,” He’s referring to current champ and record holder Joey Chestnut, who ate 68 hot dogs and buns in last year’s contest. If you’re interested in competing in a Nathan’s Famous qualifier, visit Major League Eating to register. Contests are being held in 12 cities, including Savannah, Miami, Las Vegas, St. Paul, Pittsburgh and Boston, before heading back to the New York metro area for qualifiers in Queens and the Meadowlands.